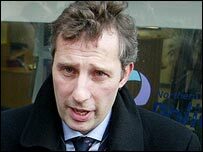 Ian Paisley Junior has confirmed he is receiving a salary from Westminster as a researcher for his North Antrim MP father. It is one of three jobs that Mr Paisley has. Sir Alastair Graham, the former chair of the Committee on Standards in Public Life, described this as "very bizarre". "It means he is being paid as an assembly member, a junior minister and also by his father from his parliamentary allowances," he said. Mr Paisley said his research job has been detailed in his register of interests since 1998. There is nothing illegal or untoward about paying a relation to carry out work, and the first minister is not the only policitican to have a relative on the payroll. Sinn Fein has already made clear that a niece of Paul and Alex Maskey works for another assembly member and the wife of a brother-in-law of Caral Ni Chuilin is employed by another MLA. The SDLP has 10 MLAs who employ family members, including party leader Mark Durkan, whose wife is a part-time receptionist, John Dallat who employs his wife to manage his office and Tommy Gallagher who employs a son. Pat Ramsey employs his wife as part-time driver and Carmel Hanna employs a sister part-time. The Alliance Party said Sean Neeson employs his wife, Naomi Long her husband, Kieran McCarthy a son and Stephen Farry his wife. The jobs vary from secretarial work to research and constituency work. The Ulster Unionists say they are still compiling a list but say it is about five or six. It is already known Basil McCrea employs a sister. The DUP list, established by the BBC, includes the deputy leader, Peter Robinson and his wife Iris who employ a son and daughter. Lord Morrow employs a sister-in-law, George Robinson employs a son and Jimmy Spratt employs his wife. Robin Newton also employs his wife and Adrian McQuillian employs a sister-in-law.